Varicoceles are common, affecting approximately 10% of men, usually during the second or third decade of life. Sometimes, these varicoceles cause no symptoms, but may cause pain or atrophy or fertility problems. What is the cause of varicocele? The blood flow normally from the scrotal veins to large abdominal draining veins, typically through the left renal vein on the left and directly into the aorta on the right. When the valves in these veins fail, blood flow reverses or not adequate, resulting in enlarged vessels (veins) in the scrotum (varicocele). What are the varicocele symptoms? In majority of patients, symptoms are mild requiring no treatment. Aching pain and pressure in the affected part of scrotum is a common sign of varicocele. Heavy lifting may worsens this symptom. Varicocele may also be associated with testicular atrophy, infertility or subfertility. A large varicocele may make the scrotum look lumpy so it resembles "a bag of worms". Ultrasound examination can clearly demonstrate the abnormally enlarged veins in the scrotum. What are the treatment options? Conventional approach for treatment has been a surgery either open surgery or laparoscopic surgery; however, in the recent years, a safe and effective nonsurgical alternative called varicocele embolization is becoming the treatment of choice for many patients and their physicians. Varicocele surgery is usually performed under general anesthesia in an outpatient setting. Occasionally, the surgery is performed with a local anesthetic. Embolization procedure is performed (by a pediatric interventional radiologist) in an outpatient setting, with sedation and local anesthesia only, and requires no hospital stay in majority of patients. Advantages of Varicocele Embolization? Embolization is as effective as surgery, does not require any surgical incision in the scrotal area, allows treatment of both sides from a single venous entry, requires no general anesthesia, less complications than a surgical approach and requires less recovery time than surgery. For more information on varicocele and embolization, click here. Who performs this procedure in the Portland area? Dr. Konez is currently only pediatric interventionalist in the area, performing this procedure. Please call (360) 425-5131 for consultation and scheduling. Images (on the left): 1st image is a venogram obtained with left testicular vein catheterization during the embolization procedure. 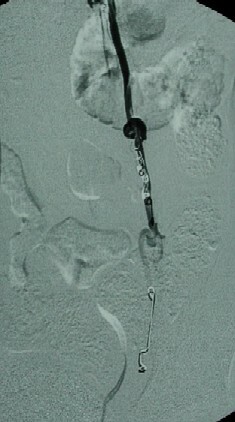 2nd image is a post-embolization image demonstrating multiple small metal spring coils in the vein. Additionally, sotredecol was used to close the vein more effectively in this case.